Ma Boyles is another pub I haven't been in for several years. It has closed and re-opened under new ownership in that time. Whilst it now has even more of a bistro feel and there is clearly a focus on food, it was much busier than I remember it last time. 3 ales were on - Weetwood Cheshire Cat & Mad Hatter & Box Steam Piston Broke. The Mad Hatter was ok, but perhaps not the ideal ale for me. Have walked past several times over the past 6 months and it's always been closed. I don't think it's closed down - they just have very strange opening hours. Visited on a Thursday about 5.00. Empty but bar staff friendly. Only one handpull upstairs which tasted pretty poor. Sign up saying 5 or 6 beers downstairs but I just know even if they were down there the bar would not be staffed so what�s the point? The downstairs room is tiny so why not put more beers on upstairs for when people walk in the place? Bizzare! 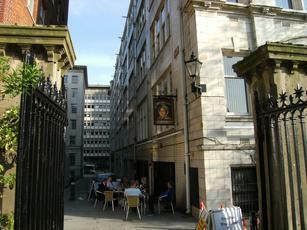 Went in a few weeks ago and paid �1.95 for a pint of Strongbow. Went in last week and was asked for �2.40 for a pint of Strongbow. I handed over a five pound note and the barmaid said "have you got the right money? I haven't got enough change!" Strange place! Was showing kids TV programmes with the volume turned down on a widescreen tele! Called in on a saturday evening. Barmaid was saying that she was going to close it early....pity she didn't do that before we went in. A very average Doombar! !